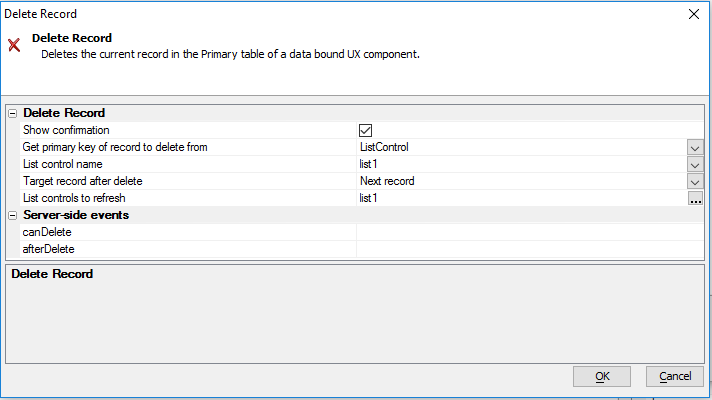 Deletes a record from the Primary Table in a Data Bound UX component. This action is used with the UX component. This action only works with tables that are data-bound. Specify if a confirmation dialog should be shown before the record is deleted. The name of the List control to use. After the record is deleted, specify which record should have focus. If the primary key source is '<PrimaryKeyList>', then 'Next record' is the next record in the primary key list that has been loaded. If primary key source is 'ListControl' then 'Next Record' is the next record in the List Control. Specify the ids of the List controls you want to refresh.